Since the Syrian civil war officially began March 15, 2011, families have suffered under a brutal conflict that has killed hundreds of thousands of people, torn the nation apart, and set back the standard of living by decades. About 13.1 million people in the country need humanitarian assistance. “It is utterly heartbreaking to see the constant calls from humanitarian organizations to put an end to the violence, suffering, and devastation of Syrian people, go unnoticed,” said Wynn Flaten, World Vision’s Syria crisis response director, in a 2018 statement. Healthcare centers and hospitals, schools, utilities, and water and sanitation systems are damaged or destroyed. Historic landmarks and once-busy marketplaces have been reduced to rubble. War broke the social and business ties that bound neighbors to their community. Millions scattered, creating the largest refugee and displacement crisis of our time. More than 5.6 million Syrians have fled the country as refugees, and another 6.2 million people are displaced within Syria. Half of the people affected are children. The Syrian army and various militant groups are fighting to control territory in the country’s northeast and northwest. 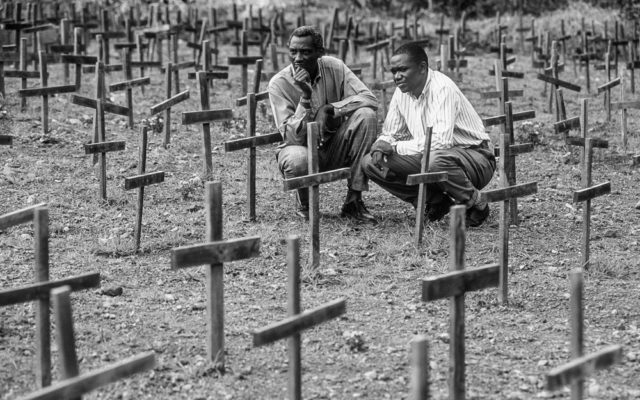 The civil war has become a sectarian conflict, with religious groups opposing each other, that affects the whole region and is heavily influenced by international interventions. Help refugee children and families fleeing the violence. 2010 — Syria is a modern society built on the cradle of civilization. Syria’s rich cultural history dates back more than 8,000 years. President Bashar al Assad succeeds his father as ruler. 2011 — The Syrian civil war begins. Peaceful protests in southern cities in March are met with violent crackdowns by Syrian security forces. Hopes of Arab Spring reforms are dashed by armed repression. Opposition groups organize but can’t seem to unite. International sanctions and other attempts to pressure the government to moderate are futile; its actions are met with defiance. 2012 — Syrians flee bombing and repression. Lebanon becomes a major destination for Syrian refugees. Many hope they’ll return home soon. Za’atari refugee camp opens in Jordan near the Syrian border. Though designed as a temporary settlement, it became home to tens of thousands of Syrian refugees who have stayed for years. August: Syria has committed war crimes, acts that violate accepted international agreements and may even involve actions against civilians, according to the U.N. Human Rights Council. 2013 — Conflict increases as other countries join the fight. March: Syrian refugees total 1 million. April: Chemical attacks are confirmed. President Assad is accused of the attacks. September: Syrian refugees total 2 million. 2014 — Humanitarian needs increase, but access to people in need becomes more difficult for aid groups. April: Azraq camp opens in Jordan; 1 million refugees are now in Lebanon, estimated to be one-quarter of the country’s population. The large number of refugees puts a severe strain on the nation’s social systems. June: ISIL declares a caliphate in Syria and Iraq’s occupied territory. Syrian refugees number 3 million in countries neighboring Syria; 100,000 people have reached Europe. 2015 — Europe feels the pressure of Syrian refugees and migrants. Hungary erects a border wall, then closes the border with Serbia to stop refugees from entering Europe. The World Food Program cuts rations to refugees in Lebanon and Jordan due to a funding shortfall. Thousands of refugees arrive daily in Greece; 1 million refugees reach Europe during 2015. 2016 — Syria is devastated by years of war. February: U.S. and Russian delegates negotiate a temporary cessation of hostilities, sanctioned by the U.N., to send aid to hard-to-reach populations in Syria. June: Tens of thousands of Syrian refugees are trapped in no man’s land when Jordan closes the border after a car bombing; about 40,000 people remain there in 2019. December: Civilians are caught in the crossfire as the Syrian government retakes Aleppo from rebels. A ceasefire to free them fails. 2017 — Syrians seek safety, stability. March: More than 5 million people have fled conflict in Syria. April: 58 people are killed in a suspected nerve gas attack. July: A ceasefire is brokered at the G20 meeting for southwest Syria. Clashes are ongoing in Daraa, ar Raqqa, Homs, and Hama provinces and Deir ez-Zor city. More than 900,000 Syrians have been displaced this year. 2018 — Humanitarian aid is limited as the conflict continues. Fighting continues, despite international agreements for de-escalation. Humanitarian access is limited because of insecurity, and 2.9 million people remain in hard-to-reach areas where aid is not supplied on a regular basis. 2019 — Refugees experience new hardships. January to February: Winter storms batter Syria, Lebanon, Turkey, and Jordan with snow, rain, heavy winds, and near-freezing temperatures. 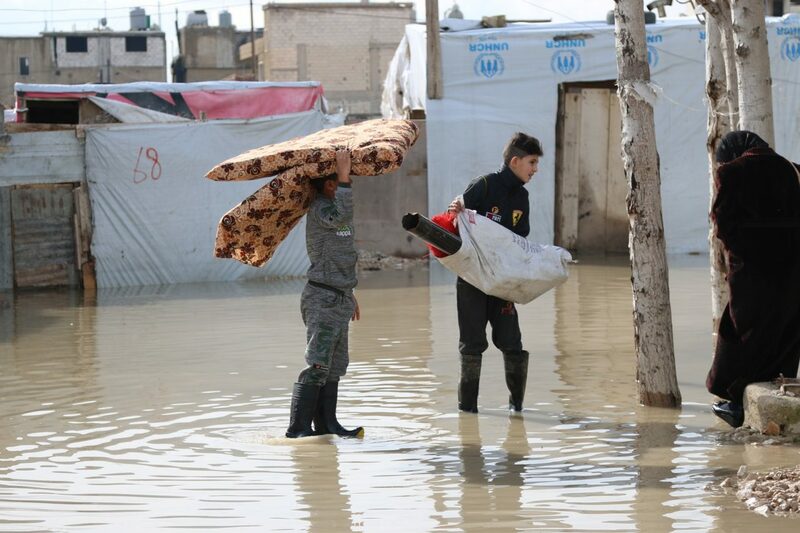 Rising floods drive many refugees from tent settlements, especially in Lebanon’s Bekaa Valley. March 15: Syria enters the ninth year of the Syrian civil war. Fast facts: What is happening in Syria? What are Syrians’ greatest needs? How can I help Syrian refugees? Why is there a Syrian civil war? What started the Syrian civil war? Why are Syrians leaving their homes? 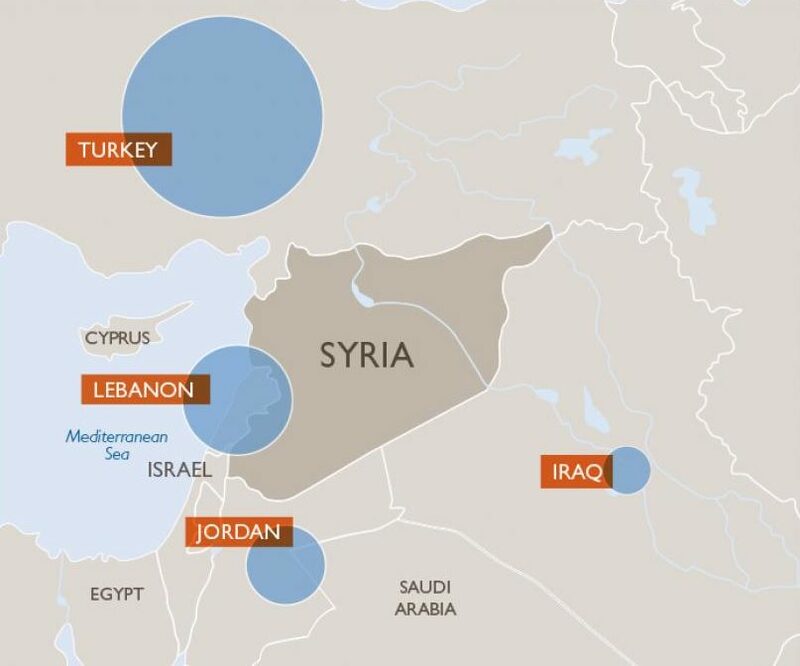 Where are Syrian refugees going? How is the Syrian civil war affecting children? 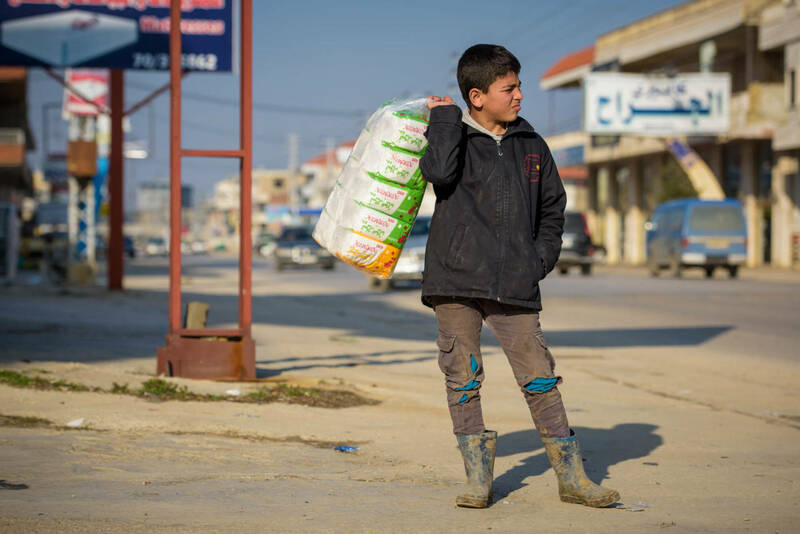 What is World Vision doing to help Syrians affected by conflict? The tragedy in Syria continues to grow, affecting millions of people. For many Syrian children, all they have known is war. Their grim circumstances have had an extreme effect on their mental, physical, and social health, jeopardizing the future of children who will one day need to rebuild Syria. Fighting continues in Aleppo and Idleb provinces in northwest Syria and Deir-ez-Zor in the east. The U.N. estimates that 3 million civilians are in the contested northwest region, and great suffering would result from escalated conflict. Humanitarian groups are unable to access many conflict areas, so there is limited knowledge of civilians’ needs. As many as 70 percent of Syrians live in extreme poverty, on less than $1.90 a day. 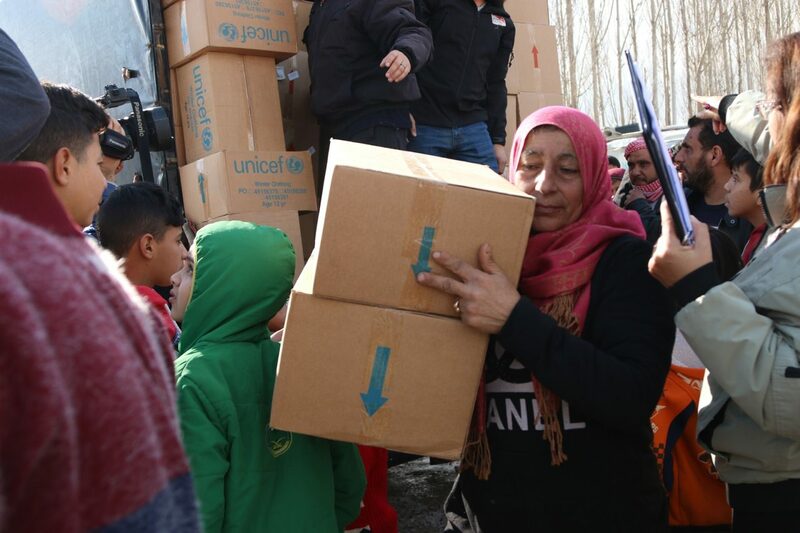 A U.N. aid convoy arrived in Rukban camp near the Syrian border with Jordan on Feb. 6, 2019, bringing food, hygiene supplies, and health assistance, including vaccines against childhood diseases. More than 40,000 Syrians have been stuck there for years trying to reach safety. Syrians fleeing conflict often leave everything behind. So they need all the basics to sustain their lives: food, clothing, healthcare, shelter, and household and hygiene items. 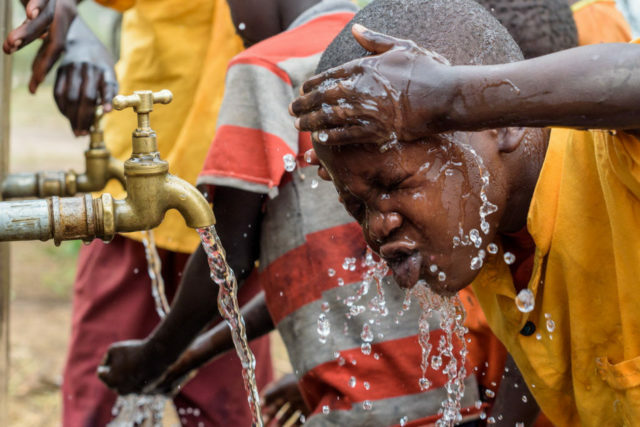 Refugees also need reliable supplies of clean water, as well as sanitation facilities. Children need a safe environment and a chance to play and go to school. Adults need employment options in cases of long-term displacement. You can help Syrian refugees by praying for them, using your gifts and influence for their benefit, and learning more about the Syrian refugee crisis. 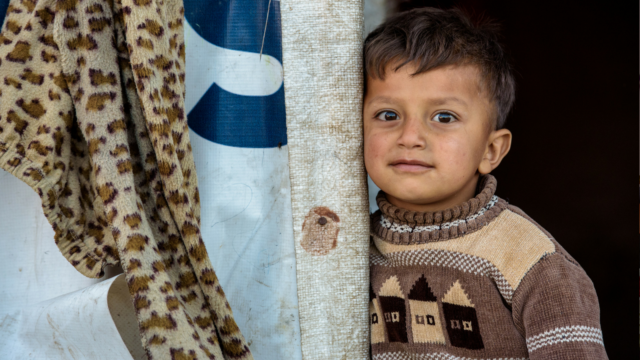 Pray: Lift up the needs of Syrian families caught up in conflict, refugee children, and aid workers. Give: When you donate, you become a vital partner in World Vision’s work to help refugees in the Middle East. Speak up: Ask Congress to prioritize the refugee crisis in humanitarian funding decisions. Learn more: Read Understanding the Syria Crisis and the Role of the Church by World Vision U.S. President Emeritus Rich Stearns. It is also a great discussion-starter for small groups. There is a civil war in Syria because conflict broke out in 2011 after a forceful crackdown on peaceful student protests against the government of Bashar al-Assad. The conflict has continued and accelerated as government troops, armed rebels, and external forces clash, take territory from each other, and vie to hold it. The consequences are tragic for civilians, particularly children. The Syrian civil war started with peaceful protests. Young people took to the streets in Syria’s southern city, Daraa, in March 2011, seeking government reforms. The movement was part of the social media-fueled Arab Spring that swept through the Middle East and North Africa. March 15, dubbed the “day of rage,” was a turning point, which is why it is internationally recognized as the anniversary of the Syrian civil war. As protests spread through Syria, they were countered by strong government crackdowns and increasing violence from both government forces and protesters. By the following year, Syria was embroiled in a civil war, with the Syrian military opposing a growing number of militant groups. Conflict has torn apart the lives of Syrian children and families as government forces and militant groups fight to take and rule territory. The country’s weakened governance, as well as the destruction of its social services and institutions, make Syria a textbook case of a fragile state. Violence: Since the Syrian civil war began, an estimated 500,000 people have been killed, including more than 55,000 children, reports the Syrian Observatory for Human Rights. The war has become deadlier since foreign powers joined the conflict. Collapsed infrastructure: Within Syria, 95 percent of people lack adequate healthcare and 70 percent lack regular access to clean water. Half the children are out of school. The economy is shattered, and 80 percent of the population lives in poverty. Children in danger and distress: Syrian children — the nation’s hope for a better future — have lost loved ones, suffered injuries, missed years of schooling, and experienced unspeakable violence and brutality. Mohammed almost waited too late to get his family to Lebanon safely. Bombs destroyed their home and shop; his brother was killed. Other families say their turning point was when militants occupied their school or their hospital was destroyed. The majority of Syria’s 5.6 million refugees have fled — by land and sea — across borders to neighboring countries but remain in the Middle East. Turkey — 3.6 million Syrian refugees are in Turkey. Ninety percent of Syrian refugees in Turkey live outside of camps and have limited access to basic services. Lebanon — 950,000 Syrian refugees make up about one-sixth of Lebanon’s population. Many live in primitive conditions in informal tent settlements, which are not official refugee camps. With few legal income opportunities, they struggle to afford residency fees, rent, utilities, and food. 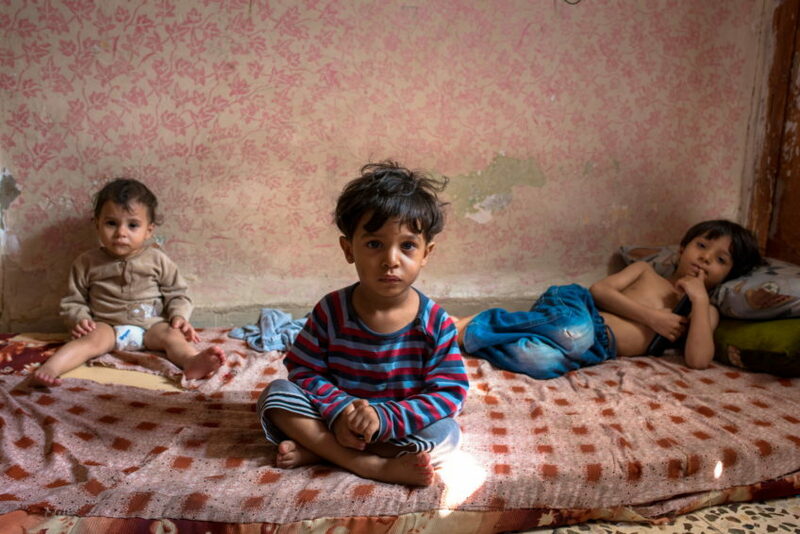 Jordan — 670,000 Syrian refugees are in Jordan. Some 120,000 live in refugee camps, including Za’atari and Azraq, where aid groups have converted desert wastes into cities. Iraq — 250,000 Syrian refugees are in Iraq. They are concentrated in the Kurdistan region in the north where more than a million Iraqis fled to escape ISIL. Most refugees are integrated into communities but the large number of newcomers puts a strain on services. Egypt — 130,000 Syrian refugees are in Egypt. At the peak of the European migrant crisis in 2015, 1.3 million Syrians requested asylum in Europe. But the number of new asylum seekers has declined significantly since then. In contrast, the United States admitted 18,000 Syrian refugees between October 2011 and Dec. 31, 2016. Read the story of Washington state resident Cari Conklin, who was among a group who greeted the first Syrian family to arrive in Seattle November 2015 — Bassam Alhamdan, his wife, Rabah, and their six children. They had escaped hell in Syria, suffered terribly as refugees in Jordan, and then were given the miraculous opportunity to come to the U.S. Many Syrian children have never known a time without war. For millions of them, the conflict has stolen their childhood and affected their long-term physical and mental health as well as their prospects for the future. Many children caught up in this crisis lost family members and friends to the violence, suffered physical and psychological trauma, and had to leave school. Diseases and malnutrition: Children are susceptible to ailments brought on by poor sanitation, including diarrheal diseases like cholera. They may miss vaccinations and regular health checkups, especially in cut-off areas. In poor housing, cold weather increases the risk of pneumonia and other respiratory infections. Child labor and child soldiers: Many refugee children have to work to support their families. Often they work in dangerous or demeaning circumstances for little pay. Warring parties forcibly recruit children who serve as fighters, human shields, and in support roles, according to the U.S. State Department’s Trafficking in Persons Report. Child marriage and abuse: Children are more vulnerable to sexual abuse and exploitation in the unfamiliar and overcrowded conditions found in camps and informal tent settlements. Without adequate income to support their families and fearful of their daughters being molested, parents may opt to arrange a marriage for girls, some as young as 13. Lack of education opportunities: Forty percent of Syrian refugee children are out of school. In Syria, the war reversed two decades of educational progress. One-third of schools are not having classes because they have been damaged, destroyed, or occupied by military groups or displaced people. World Vision provides aid to children and families in Syria, Lebanon, and Jordan, as well as Iraq, which has also suffered from conflict and humanitarian crises. Since the Syrian civil war began, we have helped more than 2.5 million people in the region. World Vision has been working in the Middle East for nearly 40 years and is dedicated to improving the lives of children, families, and the communities where they live through long-term sustainable development as well as responding to disasters — both natural and man-made. 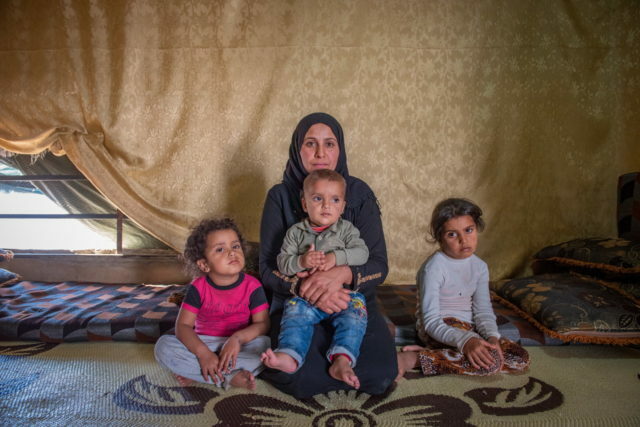 World Vision quickly extended a helping hand to Syrian families who fled to Lebanon in 2011. Since then, our work has expanded to other countries hosting Syrian refugees and into Syria. Children and their long-term needs are always first in our minds as we plan our programming. 2011 to 2012 — The Syrian refugee crisis begins. 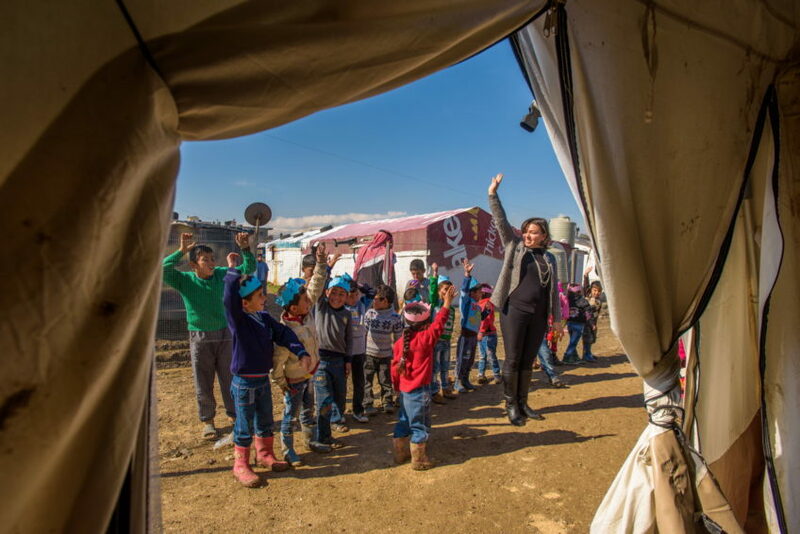 World Vision and other aid groups help Syrian refugees in Lebanon with basic needs. 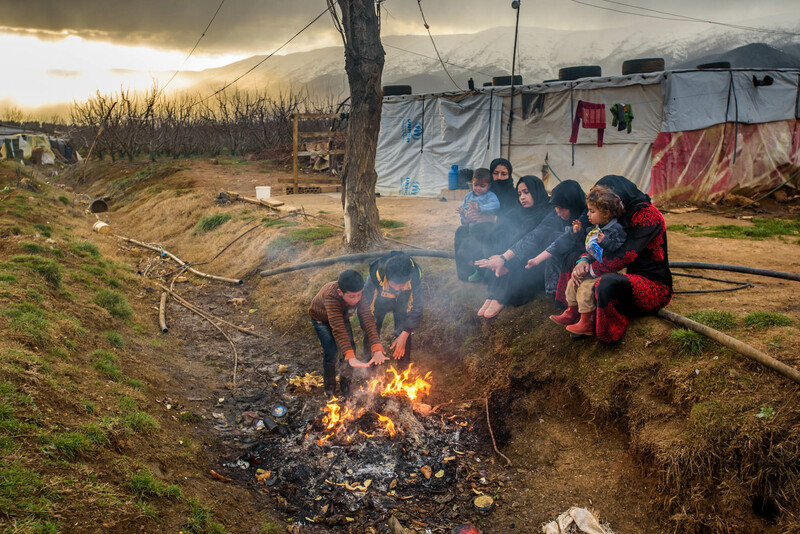 March: Refugees flood the impoverished Bekaa Valley in Lebanon. World Vision expands services, building on 10 years of children’s programming there. 2013 — Humanitarian needs increase. April: We begin aid to displaced people in Syria, providing food, water, healthcare, and household supplies. 2014 — Iraqis flee the violence. World Vision starts to aid Syrian refugees in the Kurdish region of Iraq, where there are about 200,000 Syrian refugees and more than 1 million Iraqis who have fled ISIL attacks. Our aid includes mobile health clinics, food vouchers, and water systems. 2015 — Refugees and migrants flock to Europe. September: As more refugees attempt to reach Europe through the Balkans, we provide food, water, hygiene goods, and rest places for women and children in Serbia. 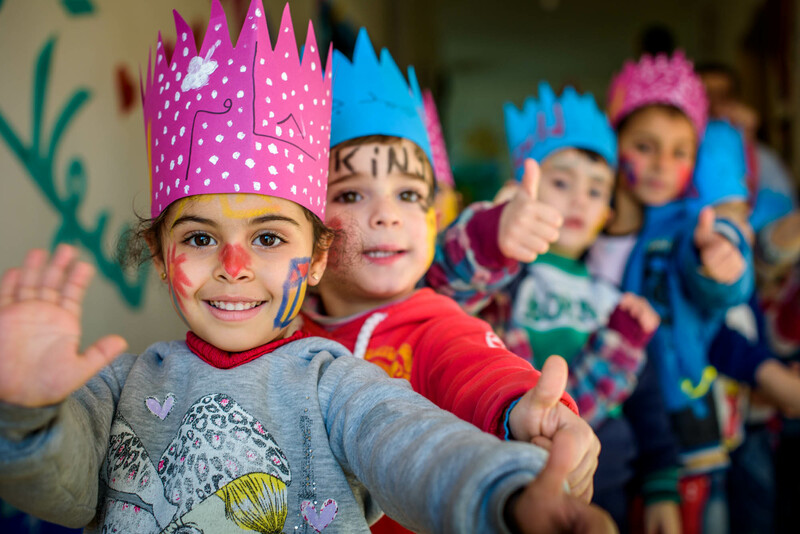 2016 to 2019 — World Vision’s work meets needs in the Middle East. Battles for Mosul, Iraq, and Aleppo, Syria, lead to civilian displacement and suffering. World Vision programs benefit refugees, internally displaced people, and locals in host communities in Lebanon, Jordan, Syria, Turkey, and Iraq. About 47,000 people receive winter and household supplies. In 2017, we help nearly 15,000 Syrian refugees in Turkey. Working through partners, we provide access to legal services, protection, translation, and nonformal education to help them cope in their new environment. Between October 2016 and September 2017, we reach 2.2 million people in the region. In 2018, World Vision distributes hygiene supplies to newly-displaced families in Idlib and A’zaz, Syria, including people escaping attacks in Eastern Ghouta. 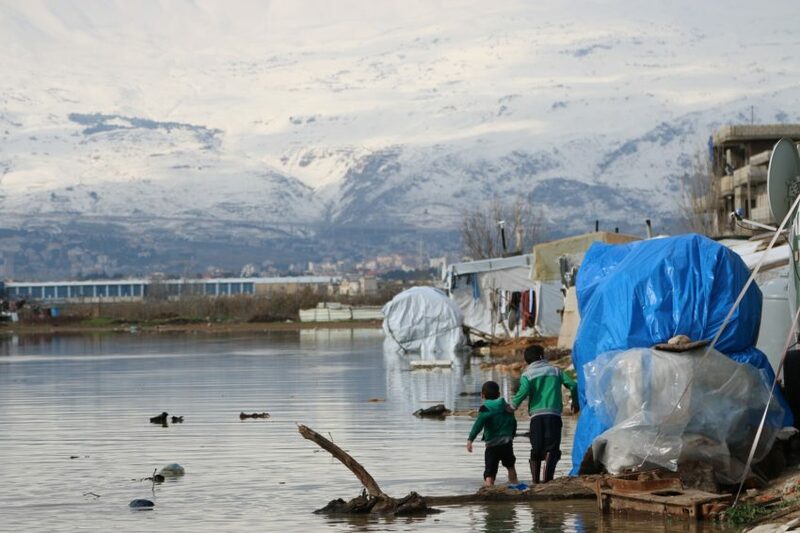 In January and February 2019, World Vision provides aid in Syria and Lebanon to Syrians affected by flooding and cold. Chris Huber, Kathryn Reid, and Denise C. Koenig of World Vision’s staff in the U.S and World Vision staff in Lebanon and Jordan contributed to this article. Help refugee children and families fleeing violence.